There are always many fascinating events in the Edinburgh International Science Festival. Last year, I went to (and reviewed here) Rock Guitar in 11 Dimensions – by Mark Lewney. He’s back again this year with a new show entitled, Music: An Explanation by a Guitar Hero. Check it out! This has been quite a performance-heavy week. Mon – Wed saw three evangelising concerts, where guitarists performed to younger pupils who will be eligible for guitar instruction next session. On Monday, P5 – P7 pupils from Campie PS played a short concert for the current P4s. The repertoire was a mix of group items and solos, the latter of which would give them some idea of what they might be doing next year. The atmosphere was great and there were some very interesting questions for the pupils from the audience. Recordings from this event can be found on the Campie PS page. In a similar vein, Tuesday saw a visit of NBHS guitarists to Law PS and Wednesday, a visit of Knox guitarists to King’s Meadow PS. Technical glitches e.g. batteries running out during performances, resulted in their being fewer recordings than I’d hoped, but there are enough to give some idea of the day. The explosive applause of P7 pupils should also convey how much the pupils enjoyed the visit. (NBHS page; Knox page). Thursday evening was the Musselburgh Grammar School Summer Concert in which the school’s Guitar Group played two items – a Scottish Medley and a Brazilian Choro. You can hear these items on the MGS page. Many thanks to all the pupils concerned for the hard work, joie de vivre and savoir faire. David Byrne writes eloquently, resonantly and, in one sense, optimistically about the future of the recording industry in the indented paragraph contained here. Spontaneity and inspections rarely appear in the same sentence but yesterday afternoon proved the exception. Upon arrival an mid-inspection NBHS, I overheard mention of voluntary meetings with members of the inspection team and NBHS staff with the intention of discussing ACfE and AIFL. I took the liberty of inviting myself along and was welcomed with open arms. For obvious reasons I cannot divulge names and details but suffice to say it was the first time I’ve sat round a table with colleagues from such diverse disciplines – and that the debate was very lively. The magnitude of current curricular reform and seems to encourage – in fact, requires – thinking out of the box and I found myself questioning aloud the automatic faculty grouping of Music with its traditional bedfellows. I would describe music as a language with an unmistakable numerical component, yet we rarely pursue these associations. One of the thorniest questions in any justice debate is “what is prison for?” Punishment? Rehabilitation? The protection of society? A mixture of the above and more? As far as punishment goes, the debate continues. Is simply being there the punishment? Is the prison simply the location where punishments (imposition of this – denial of that) are administered? The perspective of the victims of crime are often brought into the debate. Such a conversation recently unfolded on Radio 4’s Today on the subject of music in prisons (scroll down to 0743 – the time this item was broadcast). The discussion was prompted by the installation of listening posts in the foyer of the Royal Festival Hall where visitors can hear the compositions of offenders. Reporter, Nicola Stanbridge, discussed the varying points of view with Sara Lee (Projects Coordinator, Irene Taylor Trust “Music In Prisons”), Dr Loraine Gelsthorpe (University of Cambridge, Institute of Criminology) and a former prisoner. Needless to say, the conversations were punctuated by recordings of Johnny Cash from Folsom Prison. Dr Gelsthorpe listed the rehabilitative benefits of involvement as including: “well-being, relatedness, confidence & learning.” These terms will surely resonate with anyone connected to the changes currently being wrought in Scottish education by A Curriculum for Excellence. Particularly withdrawn or troublesome prisoners, who had not previously taken part in education (in any sense that mainstream teaching would imply) were often targeted for this programme. I looked in vain on the website of the Royal Festival Hall for a link to this project – but did stumble upon Art by Offenders (Koestler Exhibition). I taught a guitar class in HM Prison Edinburgh (Saughton) in the late 80s. As far as I could make out (I was only there one evening per week) the most popular classes were Art, Music, Maths (numeracy) & Chess. These relatively informal classes ran alongside a more formal Open University programme. This Friday sees the retirement of Ann Cruickshank after 33 years of service to Musselburgh Grammar School’s Music Department. As this coincides with the beginning of the October holiday, Ann decided to throw a retirement ceilidh/party last night in Edinburgh’s Corn Exchange. It was a fantastic occasion and Ann was clearly over the moon to be sharing the evening with so many friends and colleagues, past and present. The ceilidh music was provided by Laurie Crump and friends. Laurie is the husband of MGS’s universally popular, and boundlessly talented Woodwind Instructor, Juliet Aspley. Between ceilidh sets, there were sessions of lovely solo jazz guitar by Robin Robertson. Lifelong friend and guitar predecessor at MGS, Mike McGeary and I also performed a short, affectionate send-off to Ann. Between us, Mike and I represent 26 years of collegiality with Ann and it’s always nice when a send-off takes the form of the activity that brought us together. Always one of the first in the building each morning and with barely a day’s absence since 1975, Ann will be a much missed member of staff. Thanks for everything, Ann, and don’t be a stranger now. After 17 years’ service to Wallyford PS, Mary Vevers was honoured with a retirement assembly. 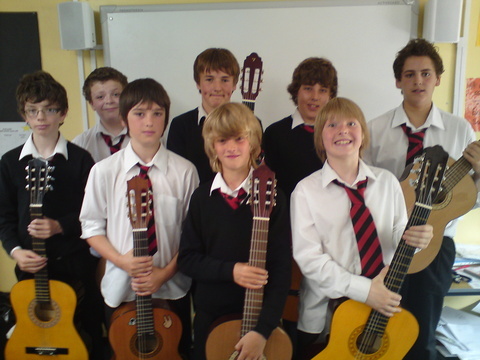 Part of this included a performance by a guitar group featuring current and former pupils. After playing a few tunes, we were joined by the Staff Choir who, with minimal rehearsal, sang a reworded version of Richard Rogers’ Happy Talk as a send-off for Mary. Among the lines describing the freedoms afforded by retirement was “…..even have your lunch before the bell.” With an irony that you could plan, the bell chimed in as this line approached. Personnel details and mp3s are available on the Wallyford PS page. At this time of year the formal timetable often yields to entertainment, liaison and evangelism. Apart from the obvious benefits, this removes the incongruity of final lessons where no homework is given and no sense of urgency obtains. The Big Gig @ MGS. This event always involves self-taught pupil bands, dance groups, staff performances (usually comical) and a staff-student band. This year a new element was included in the staff-student House Band which had interesting consequences – a horn section. As the horn parts had to be arranged and written out, this meant that the band had to adhere to and memorise the structure. The rehearsals were definitely a little more fraught than usual as there was clearly more discipline than some would have liked in their spare time, but the results made it all worthwhile and I feel sure that all involved felt that they’d raised their game. Campie PS – guitarists from P5-P7 put on a concert of ensemble and solo music for P4 pupils. The audience contained next years new guitar players, and I was bowled over by their rapt attention. The situation also includes an opportunity for the P4s to question the existing players about what is involved in learning an instrument at school. Four S3 guitar pupils from NBHS will accompany me on a trip to Law PS to play for the P7s. This coincides with the eve of the P7 pupils’ visit to the High School and so there should be an extra edge to the transitional feel of things. The P7s eduBuzzers plan to podcast the event so keep an eye on the Law PS blog. There will also be time for questions at this event. MGS Summer Concert. There should be a doubly transitional feel to our Guitar Group this year. We are to be joined by two extremely enthusiastic P7 pupils from Wallyford PS and also by two former pupils who, as they are coming in to lend a hand with sound-mixing, will no doubt join the ensemble. This means the age gap between youngest and eldest will be 8 years (I’m not including myself in this equation). In addition to playing in our own ensemble, some of the pupils play in the orchestra, jazz band and a new traditional music ensemble. P7 Leaving Assembly @ Wallyford. I can’t be at this event as I’ll be in another school but will be present in digital form – on a CD to accompany the pupils. This will be a new discipline for them as a CD can’t jump to their aid like a teacher. Retirement Assembly @ Wallyford for a much loved member of staff. The plan is to bring six former pupils across from MGS so that, along with the P7s we can play, for the pupils and staff at this send-off. I can’t think of a nicer way to end the school year.